Too funny. I was working on a post about brick and stone fireplaces when I checked my email. And I had three emails from Nancy Keyes, my new best friend who if it was 20 years ago, maybe we would’ve gone into business together!? If you missed it, here’s the post where I began talking about her giga-gorgeous kitchen restoration. Not only did I have a slew of new photos, she gave me the other day, the formula for THE beautiful gray cabinets. It’s the color that she had custom mixed at her Benjamin Moore Store. I didn’t ask her for this. I repeat. She GAVE me the formula! Alright, all right… calm down! Yeesh! Aren’t you guys exhausted from shopping? Guess not. Laurel, just STFU and tell us what it is! Okay. Sorry. You know I’m just teasing. I made a little graphic with the formula. And yes, you have permission to pin it! Goodnight. haha I’m not really leaving just yet. It’s all beautifully accessorized now. Nancy told me that when friends come over while standing in this gorgeous #unkitchen, they want to know which way the kitchen is. Too funny. Nancy inherited much from her mother and grandmother. And she’s also a flea market hound. I love everything. I want it all! Every detail makes my heart sing. Sorry if that sounds sappy and trite. Now THAT is a collection! Nancy had this drawer customized down to the last quarter-inch. That’s a designer! I have no idea what those curly things are, but I love them! And I love the prints in the vestibule. How cool is this little tucked away bar area with a lovely linen skirt. And I adore that the radiator was left untouched except for a coat of fresh paint. By The Way, if you didn’t catch it before, the walls are Benjamin Moore Decorator’s White. Speaking of which. It is clear to me that the moulding and walls are the same color, which I love and recommend. Looking in from the library. I do have more. But I’m going to save it for next time. Thank you so much Nancy– for your generosity and sharing your exquisite home with us! So my follow ups to the uber flattering blog this AM. Forgot to tell you that the tongue and groove ceiling is painted paper white. I know that is one of your colors, too. I have used it before even in interim house in the Atlanta home. The curly things are baffles from a mid-century industrial light fixture. I saw them in a box at Don Scott’s Antique Show (Bunny, John and Furlow shopped there each month)… the one thing I desperately miss about ATL. The dealer had just sold the fixture but the buyer didn’t want the baffles. I asked how much…he said $1 each. A friend was with me and he said I’d like them better for $5 for all of them…So he said OK. So the prominent wall in the room is dressed for 5 bucks. They were in the dining room in Atlanta as a frieze. Marc found the pieces behind the stove in a shop in Red Bank. They were fireplace inserts from a 1900 house that was sadly torn down a mile or so from here. They are black iron and we had the iron shelf made to cover the seam. The bar is over the washer and dryer. The 4 four watercolor paintings were in a portfolio that a friend bought for $5 for all and gave me as a house warming gift for our lake house. PS: Jennifer had a question about the backsplash and this is what Nancy and her wonderful contractor came up with. Have to say that I absolutely love this treatment with the wood trim! What a beautiful post-I think I was thunderstruck when I realized whose home you featured!It just doesn’t get any better than Maura’s and Nancy Keyes swoon worthy homes, and that we at least all live in NJ. is lovely too. 🙂 Coincidentally, a few weeks ago my sister made me sign up on instagram because she was so totally smitten with Maura’s home, and she knew I would be too.She was soo right! Laurel- I forgot to mention that I so covet Nancy’s built in library with that gorgeous ceiling! Yes! She is and she has a great account! Her Lily is adorable! I’m so sorry that you lost your sweet baby and it sounds like your other doggies are mourning the loss too. I miss my Peaches so much. I’m sorry Mary, I wish I could voice an opinion, but I’m working blind here. It could also be a burnished bronze or burnished gold. (antiqued) If it’s a metallic color, please don’t just spray paint it a flat color. That will look cheap and horrible, IMO. This is a great kitchen, but I’m more interested in the outdoor light fixture beside the front door….do you have clues about the source? I have cedar siding and dont want to cut into to hang new fixtures. These are the right style and look as if they won’t need chunks of siding cut out to hang them. Or maybe you could recommend lighting sources on-line that have some like these. I love your blog and appreciate that so many people will let us into their homes to see their beautiful rooms. Thanks for doing this for us. haha – I have two of those pictures by the range, same frames. I’m not using them right now and had forgotten about them – maybe I’ll have to resurrect them. I also collect dishes. I love this kitchen. So many good ideas. I love the kettles below on the open shelves but would be afraid that my cats would think I planned that for them. Not much was said about the custom shade of gray but I love it and I am not a fan of gray. Laurel, would you say that it has bluish or lavender undertones? Looks that way on my computer. Also, could it be used with shades of lavender? The paint is a custom Benjamin Moore color. And the formula is in the graphic at the top of the page! As for undertones. Great question and also very interesting to me. It was custom-made to go perfectly with the stainless steel. It is definitely not purple-ish or blue-ish. I can say with a fair amount of confidence that you are looking on a PC. I used to use a PC and didn’t realize until I got my mac two years ago that the PC puts a blue-ish cast on everything. Everything looked very yellow on my mac. But the mac is far more accurate! The photos are color corrected. They were more blue and lavender when I got them as they were most likely straight out of the camera. All photos out of the camera need editing! But most people who are not professional photographers, don’t realize that. And even a lot of pro photographers don’t bother. Since it’s not my kitchen, I can’t say if the color changes and reads ever so slightly one way or the other. Most colors do including gray colors. Nancy is reading these comments (I think) and if she sees this, perhaps can weigh in. What is the black “backsplash” behind the stove? Embossed metal? Antique? Hard to clean? I love the intimate bar area that doubles as a laundry room. How practical, ingenious and creative, all at the same time! Thanks so much Nancy for sharing your beautiful custom color with Laurel and us. I’m glad you will have more photos for us, Laurel. Your commentary is wonderful. Nancy’s home(s) are so full of flair and panache. They look so comfortable and make wonderful use of family and collected items. It’s all so pleasing. If Nancy chooses to follow up…the kitchen windows – are they operable? Original? Are there screens or storms that used – not in the photo? Wood or metal? They look wonderful. Thank you so much! The windows are new, true divided light single pane wood. The two on the ends do operate. We knew we wouldn’t open the others so they are fixed. No screens. I don’t have screens on any of the windows. Do you know if the industrial chandelier inspired by Jean Louis-Denoit is able to be purchased? 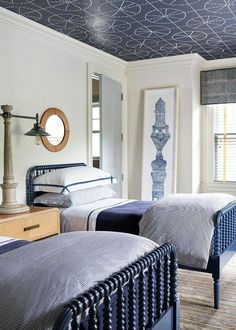 I have a client who has fallen in love with that lighting fixture.. Any info you can give me that would help me in my search would be greatly appreciated. This may be too late and perhaps not quite the look your client is after but I’ve just come across something you may be interested in. I am a Lighting Specialist with the ALA and was just perusing the new releases from several of the lighting suppliers whose lines I specify. Savoy House has a new chandelier, the Piper, which is very reminiscent of the Jean- Louis Deniot fixture that the very talented Nancy Keyes used as inspiration for her fixture. I hope this might be of some help. Happy Boxing Day! My ex-laws are expat South Africans living in Toronto, so I’m familiar with that one. Nancy is definitely around and I know that she’ll be very flattered that you are using her kitchen for inspiration! Do you mean a panel of wood as opposed to a moulding applied to the wall itself? That’s a very good question. I’m not sure. We just went through all of the photos because we actually couldn’t remember! The moulding was applied directly to the sheetrock. You can’t tell by looking at it because it was hand painted instead of rolled like the upper part of the wall, so it appears to be wood. Thanks so much Nancy for confirming that. So much simpler and affordable than tile and I like it as much or better. Thanks so much for that Nancy! Hi Again! Thank you so much! There are 2 pantries. If you look at the picture looking into the kitchen with the bookcases…they are on the other side of the bookcases. We are lucky in our 1910 house to have a basement where we have another pantry to store chafing dishes and things that you use once a year. The other side has food and everyday dishes. We don’t have a microwave. I put a shelf in the pantry for one and decided I didn’t want one. I am so excited to read that you are working on that brick fireplace post, Laurel. Can’t wait to read your opinion and suggestions, etc. It was nice to see your blog mentioned yesterday over on Maria Killam’s blog post about painted brick. Two of my favorite design bloggers together on one post, woo-hoo, LOL! Nope, not the first as you can see now, but no matter. I answer everyone in order and unfortunately, have had to put on the comment moderation. Wish I didn’t have to, but every once in a while, I get someone who feels it’s their place to criticize in an nonconstructive way, either me or a reader. And we can’t have that! And yes, I saw the comment too on Maria’s blog. And lucky me, it is in the top position and has sent over a ton of blog readers! I’m with Phyllis! Love the gray and how lucky we get the formula too! And waiting with bated breathe for the brick/stone fireplace post!! We also have custom color in our new kitchen-but it’s lacquer..they have their own formulas..they can emulate every color but do it differently? anyway..this formula seems being lacquer too. Am I correct? and only now I notice lol-my formula starts with Jenny..:) original mind! I like that kitchen very much, I hate upper cabinets now and feel like the walls are closing in on me. Nancy’s kitchen is too good. Ms Keyes is giving Nancy Meyers a run for her money. (Something’s Gotta Give kitchen). Yes, indeed! I was swooning in the aisle when I saw that movie! And that kitchen, 13 years later–in face the entire home stands up totally fresh as it was back then. Now, why is that? haha! I heard from Nancy who answered all of those questions that we all have. She’s so unbelievably creative!